Known as some of the most elegant sarees in Maharashtra, Paithani Sarees are one of the most popular regional garments in India. The identifying characteristics of this garment include the peacock designs on the pallu along with a pattern comprising of oblique squares on the border. While these sarees tend to incorporate a kaleidoscope of colors, making them incredibly visually striking, plainer designs with single colors are also quite coveted by women throughout the country. A Paithani Saree is considered to be unique because of the way it is woven. A thread of color is used to weave the fabric lengthwise while a different color is used to weave it widthwise, which is how the kaleidoscopic effect is achieved. Another specialty of the Paithani sari is that it is a silk sari with traces of gold zari in it. As this garment was designed for wealthier and more sophisticated buyers, it was created in a way that ensured that it would be immensely rich and intricate. Due to the fact that this form of sari originated in such close proximity to the Ajanta caves in India, one can spot a lot of Buddhist influences on the garment in the form of patterns and motifs, such as the lotus flower on which the Buddha sits. Aesthetically, these symbols are rarely used in India, which again makes this garment a unique artifact. In spite of, or perhaps because of, the amount of attention given to detail on the body of a Paithani saree, blouse designs in general tend to come across as somewhat plainer. This garment has such a regal air to it mainly because it is woven in the same fashion as tapestry weaving, as opposed to using wefts (as is the case with other silk sarees). There are three distinctive types of this garment when classified on the basis of color. The Kalichandrakala is completely black and has a red border on it. 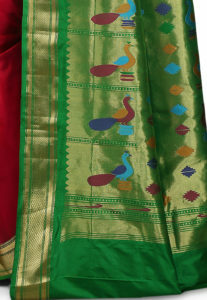 The Raghu is a popular Paithani saree in Pune and is a parrot green garment. The Shirodak is an immensely elegant white saree that is worn mostly by women during an extremely formal affair (it is not, however, worn during a religious occasion as white is considered to be inauspicious and the color of mourning).Paithani sarees, regardless of the type, are some of the most regal garments in India. When it comes to Paithani sarees, collections boasting both trendy and traditional designs can be found in India. 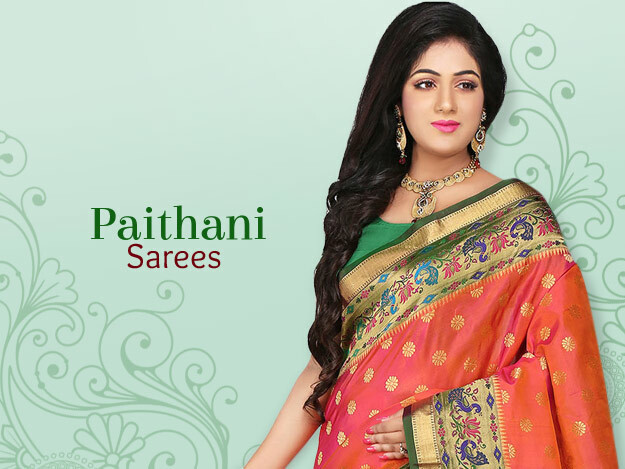 One can even buy Paithani sarees online from the comfort of the home or office. You can get pure paithani silk saree from Utsavfashion.com, we’ve pure paithani silk sarees that are handcrafted by expert craftsmen in India. Yow will get them delivered to your doorstep. Due to the fact that a Paithani sari is such an elegant and stately garment, it needs to be styled in a way that is somewhat grand and majestic. Heavy Indian jewelry is popularly worn with them especially for formal occasions and events. Some of the most complimentary styles of jewelry with this sari include Kundan sets, Polki sets(made with uncut diamonds) and Meenakari sets. As this saree is made of silk, a string of pearls can also set off the color of the fabric in an extremely chic manner. 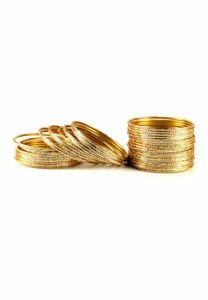 It is also a great way to juxtapose an ethnic garment with what is considered to be a western form of jewelry. 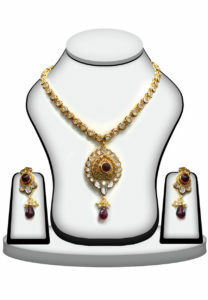 Sets of jewelry generally include necklaces, earrings and rings. When wearing a Paithani sari, women prefer to wear as much jewelry as possible for weddings and other formal occasions where an ornate look is necessary. Many times, the jewelry is paired with flower arrangements in the hair to add to the ethnic look and create an ensemble that exudes poise and elegance. Western forms of jewelry such as diamond sets also look fantastic with these sarees. Handbags are a must, no matter the nature of the ensemble. Most women prefer wearing Indian handbags with their saris as it falls into the spectrum of ‘ethnic attire’ and will match the traditional look of the garment. Some of the popular forms of such handbags include embroidered handbags, moti work handbags and cutdana handbags. Women usually prefer carrying chain link clutches that have an outer covering of an embroidered or pattered fabric which can match with the designs on the Paithani saree. Some women also prefer creating a clash of textures by carrying a beaded handbag instead of a plainer, embroidered one. Although many women do carry Indian bags, some may prefer western handbags due to the slightly more sophisticated aura they lend to the ensemble. However, the choice of handbags is purely an aesthetic choice, depending solely on the type of Paithani saree and the event in question.